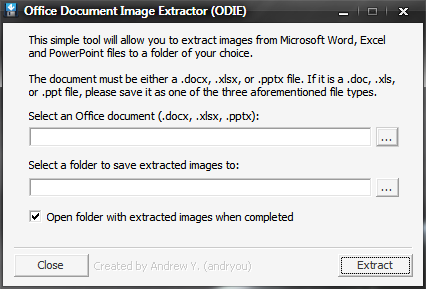 This simple tool will allow you to extract images in their original quality from Microsoft Word, Excel and PowerPoint files to a folder of your choice. The document must be either a .docx, .xlsx, or .pptx file. If it is a .doc, .xls, or .ppt file, please save it as one of the three aforementioned file types. It has been coded in NSIS (Nullsoft Scriptable Install System) and uses 7-Zip to extract the images from the supported document types.